No matter what your past has been or where you are in life, we believe everyone has a powerful story. We don't have a dress code—so wear whatever makes you feel most comfortable. When you arrive, you'll find our greeting team at the entrance. Once inside, you'll see where you need to go. We have lots of coffee, so feel free to pour yourself a cup on your way into the sanctuary. Services are a little over an hour. There is a time of music, a relevant message, and other elements which help us encounter the love of God. We have Bibles available underneath our chairs, so please take and use as you need—and you can even take it home with you. ​Have any questions at any point? Anyone wearing a blue Fellowship polo is available to help. From the​ moment you pull into the family parking area, you'll find an optional wagon ride available for your kids to take them to the children's check-in area. On your first visit, plan a few extra minutes to register your child. We have a team of trained and background-checked volunteers who provide learning opportunities for children birth through 5th grade during the morning service. Have any questions at any point? Anyone wearing a green Fellowship polo is available to help. In the service, fill out a connection card (found inside the bulletin) and put it in the offering bucket when it's passed. We have community groups available for you to deepen your relationship with God and others within the church. We have plenty of ways for you to get involved. There are many opportunities available. ​explore what following jesus means. We would love to have conversations about what a relationship with Jesus is all about. To be a church of all stories and backgrounds. We are #forMacomb. This means we continually seek opportunities to selflessly serve and improve Macomb County. We believe the Church is the body of which Christ is the head and all who believe in him are members. (Ephesians 1:22-23; Romans 12:4-5). ​Robert has been changed by the love of Jesus, and desires to share this life-changing love with everyone around him. He has a deep passion for the local church and believes God desires to spread his great love through a church's presence in the community. Before coming to Fellowship in September 2016, Robert served as the director of student ministries at another local church for four years. He received his Master of Divinity from Bethel Seminary in St. Paul, Minnesota, and his Bachelor of Science in Business Administration from Valparaiso University in Valparaiso, Indiana. A graduate of Utica High School, Robert has a deep love for the metro Detroit area. While he enjoyed the transformation that God took him through outside of Michigan, he is excited to be here in his home state. Robert believes everyone has a unique and powerful story. He is always open to hearing about what God is doing in the life of people around him. You can always reach out to him for a cup of coffee and a discussion on just about anything. When he isn't in a church or coffee shop, you will find Robert spending time with his family (wife Jessica and two sons Jacob & Owen). Jessica really enjoys running, so Robert has learned to love running out of a love for his wife. ​Julie loves God and she loves children. While still in high school, a leader in the church saw potential in Julie and mentored her to be a teacher for the elementary kids during the worship service, and that ignited a passion for children’s ministry. She was born and raised in the Muskegon area and moved to the Detroit area for an engineering job at Saturn after college. Before coming on staff at Fellowship, Julie spent time volunteering with the parenting program at Beaumont as a field leader for MOPS International and as a coach for FIRST Robotics. She is married to Jeff and they have four boys. You will often find Julie running, hiking, or at Starbucks. ​Nate was born and raised in the Detroit area. Trusting in Christ at a young age, he truly discovered what it meant to follow Jesus in middle school. It was also around this time he discovered he loved leading people in worship by helping lead chapels at his school. After continuing to develop spiritually and musically during high school, he moved to Louisville to pursue a Worship & Pastoral Studies degree at Boyce College, which he is currently in the process of finishing up online. Nate loves writing, recording, and producing music. Helping to instill a creative atmosphere of originality and vulnerability within Fellowship Music is one of his favorite parts of his position. He produces for and plays in a band called Dash Avenue, and he also sings and plays various instruments including keys, guitars, and percussion. But even more than music, Nate has a passion for people—whether it's in a worship service or hanging out with his friends. If Nate's not at church or writing a song, he might be at Starbucks (most likely), at Guitar Center, or researching the next place he wants to travel in the world. Roger loves being involved in the passionate service and dynamic growth that young people are capable of. 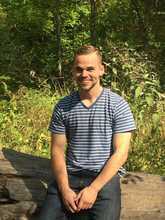 He was called from the career path of computer animation to that of youth ministry during his college years as God worked on his heart and sense of purpose. He grew up in the Macomb area and graduated from Rochester College with a degree in Youth & Ministry. He also had three years of experience in the field of youth ministry before coming to Fellowship. ​In his free time, Roger can be found enjoying solitary time with a good video game, book, or movie. When it's social time, he can be found hitting the town or park with friends and family accompanied with some good food or group activity. He loves hearing a powerful story, profound thought, or contagious laugh. His favorite TV shows are superhero-themed, and his favorite foods usually involves some form of red meat.